This following article is adapted from Chapter 17 of the newly revised edition of my book, Dowsing: A Path to Enlightenment. It is Part 1 in a two-part series. Part 2 will be posted soon. You can also get another excerpt about blessing electrical fields (EMFs) to help you in life by subscribing to our newsletter. 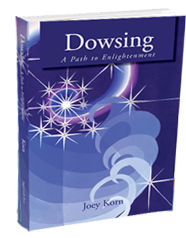 Posted on November 16th, by Joey Korn in Featured, Latest News, Spiritual Dowsing & the Simple Blessing Process.